Brown marmorated stink bugs often aggregate in large numbers on sunny sides of buildings. In the nation’s capital, “distracted driving” was the topic for a major summit hosted by Department of Transportation last week. In addition to distractions caused by text messages, bugs seek refuge in vehicles as well as homes. On a recent visit to a farm, I found the cab of a truck occupied by no less than 50 brown marmorated stink bugs seeking shelter from approaching winter. On a warm autumn day, stinky bugs on the dashboard and windows could create quite a distraction to non-bug geeks. During the past several weeks, many distraught homeowners have called regarding disagreeable shield-shaped insects congregating on doors, windows, and siding. Worse yet, in several homes these petulant bugs gathered en masse near windows and invaded homes. Brown marmorated stink bugs are members of a large clan that include the harlequin bug (LINK SEPT 3, 2007) and green stink bug both of which are important pests of vegetables. The brown marmorated stink bug is a native of China, Korea, Taiwan, and Japan. Since its discovery in 1996 near Allentown, PA, it has been found in Connecticut, Delaware, Idaho, Indiana, Illinois, Iowa, Maine, Maryland, Minnesota, Mississippi, Montana, New Jersey, New York, Nevada, Ohio, Oregon, South Dakota, Tennessee, Utah, Virginia, Washington, West Virginia, Wisconsin and Wyoming. In Asia, it is a serious pest of fruit trees including peaches, apples, cherries, figs, mulberries, and persimmons. More disturbing than its fondness for fruit, is its appetite for soybeans. Maryland’s soybean growers report astounding numbers of these pests in soybeans. The extent of their damage to soybeans is currently under investigation. In North America, this stinker has also been found attacking more than seventy species of plants including herbaceous annuals and perennials and many species of woody trees and shrubs. The business end of the brown marmorated stink bug is an elongated proboscis used for sucking. Stink bugs insert needle-like mouthparts into leaves and fruit, inject digestive enzymes into the plant tissue, and slurp liquefied food into their belly. White bands on antennae, legs, and abdomen are characteristic for brown marmorated stink bugs. The life history of this pest is similar to relatives we met in previous episodes of Bug of the Week such as boxelder bug (LINK MARCH 30, 2008), squash bug (LINK SEPT 8 2008), and golden rain tree bug (LINK OCT 8, 2007) . After consuming a vegan diet of plant fluids all summer, the cool weather of fall triggers an instinct to find protected locations to survive winter. Before the time of man and his dwellings, shelter resided beneath logs, vegetation, or rocky crags. However, homes and structures make nifty refuges for these opportunistic creatures and in autumn, they move into homes, garages, and sheds. In chilly attics, foundations, and beneath sidings, stink bugs rest and wait. On warm days in March or April, stink bugs become active and appear wandering about windows and floors as they attempt to move outdoors to find food. From June until August the mottled gray-brown females lay green, barrel-shaped eggs in clusters of 20-30 on the undersides of leaves. Young nymphs hatching from eggs sport black patches and lines against a background of yellow-orange. These magnificent nymphs are gregarious and often found in large numbers. Older nymphs are gray-brown with alternating light and dark bands on their abdomen, legs, and antennae. Alternating bands of dark and light on antennae, legs, and abdomen are diagnostic for this pest and give them a marbled appearance. When disturbed by a predator or a broom, they live up to their name and emit a memorable foul odor from their stink glands. What can be done to control this invader? Ultimately, you will prevent these from becoming a nuisance in your household much the same way you prevent invasions by camel crickets (LINK TO NOV 24, 2008) or multicolored Asian lady beetles (LINK TO FEB 25, 2008) . Actions good for energy conservations will aid in your battle against the bug. Eliminate points of entry around your foundation, windows, facer boards, and eves by screening, caulking, and repair. If the little devils are already in your home, sweep or vacuum them, and send them to the great beyond in an environmentally appropriate way. We thank all of the crew at the Western Maryland Research and Education Center and Master Gardener Tina Webster for assistance in preparing this episode. 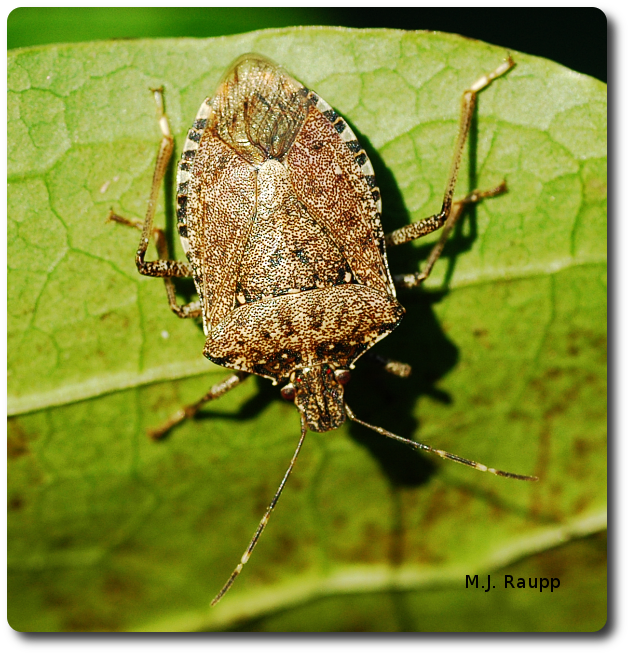 For more information on the brown marmorated stink bug, please visit the following web sites.